Watching a loved one wither away from insufficient food and liquid intake or choke and cough when eating is traumatic. At Lifemere we have taken a medical, nutritional and practical approach to providing you with products that offer solutions to make mealtimes more efficient, safe and enjoyable for those experiencing feeding and swallowing difficulties. A large emphasis on “restoring dignity”emerged in Aged Care and Palliative Care. 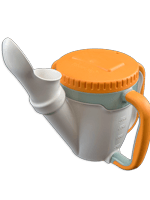 The RoseCup is a unique drinking cup designed specifically to assist people who are experiencing eating difficulties or dysphagia symptoms. 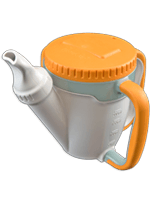 The RoseCup and specialised attachments assist in safer swallowing, hydration and nutrition. 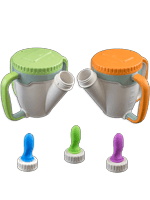 It is a Class 1 Medical Feeding Device, developed and manufactured in Australia and registered with the TGA. Thank you for such a wonderful product. It has given my mom back some independence with drinking. The cup design and quality is wonderful. I am so excited to share info with friends and co-workers and plan to write something up for the CurePSP website as we tried numerous cups over the years with no luck. We recognise the day-to-day challenges of both sufferers and carers and will continue to develop specialised products to assist dysphagia patients and carers of those within every age group and level of disability.